Observation - Red Squirrel - UK and Ireland. 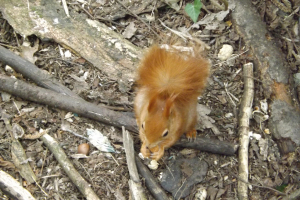 Description: Red squirrel almost certainly - relatively tame coming to take nuts from those proffered and burying them in the woodland nearby. Observed in a small nature reserve on the Isle of Wight. Red squirrel almost certainly - relatively tame coming to take nuts from those proffered and burying them in the woodland nearby. Observed in a small nature reserve on the Isle of Wight.